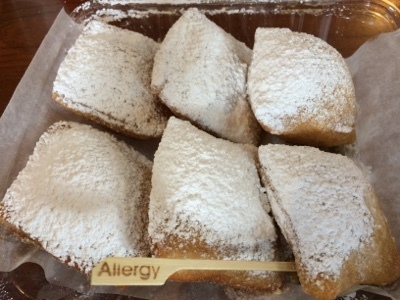 I remember how excited I was to learn that gluten free beignets were available at Sassagoula Floatworks & Food Factory, a quick service restaurant at Disney's Port Orleans Resort - French Quarter. Years ago, you used to have to contact Special Diets at least a week in advance to order them, but now they are available all day without advance notice. So you might be wondering what a beignet is and how it is pronounced. 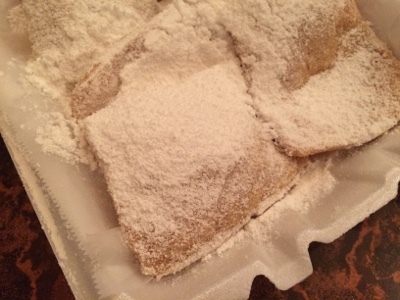 A beignet (bin-yay) is deep fried dough covered in powdered sugar. Beignets are popular in New Orleans, and are traditionally prepared to order, so they can be eaten hot, right out of the fryer. 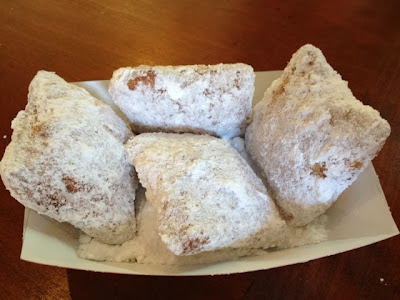 Here is a picture of the very first beignets I ate at Sassagoula Floatworks & Food Factory. 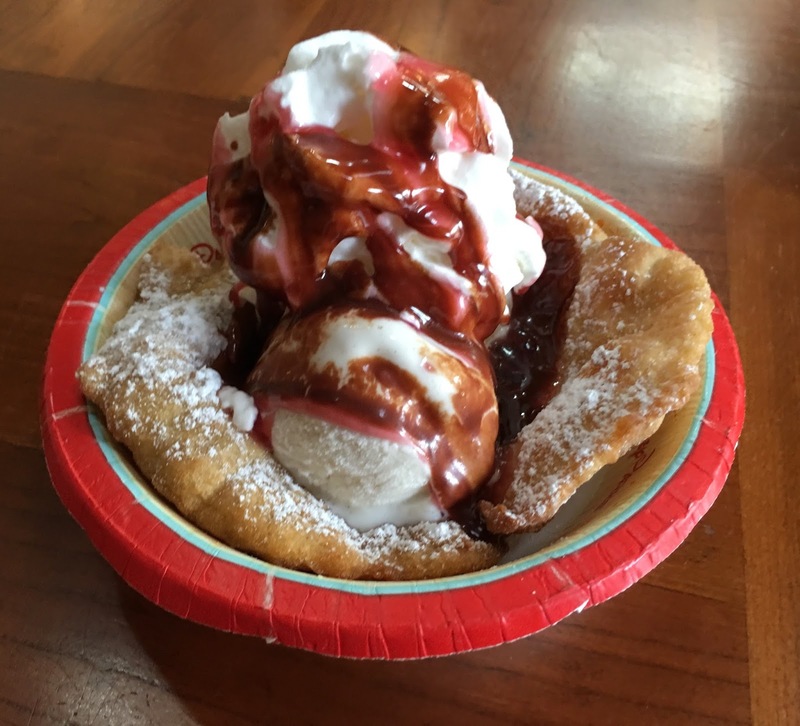 They are available in orders of three or six, but I was given four that day, because you used to have to pre-order them through special diets, and the beignet dough had not been defrosted when I arrived, so we went to the Animal Kingdom, then came back. The beignets were delicious, and certainly worth the wait! 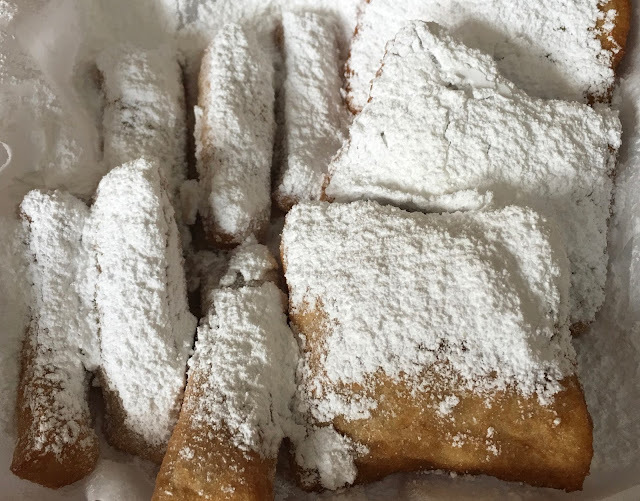 They were hot, right out of the dedicated fryer, and covered with powdered sugar. I am so glad we ended up coming back that day, because I had a chance to meet Chef Tony, the head chef at Port Orleans - French Quarter. He told me that the majority of the menu at Sassagoula can be made gluten free. I typically order six beignets, and yes, I eat them all. With a 20% discount from my Tables in Wonderland card, they cost less than $5, which is one of the best breakfast bargains at Disney World. 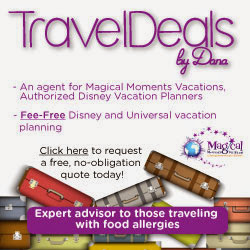 If you are using the Disney Dining Plan, you can use a snack credit for orders of 3 beignets. In the last two years, the chefs at Port Orleans have been experimenting with the gluten free beignet recipe. 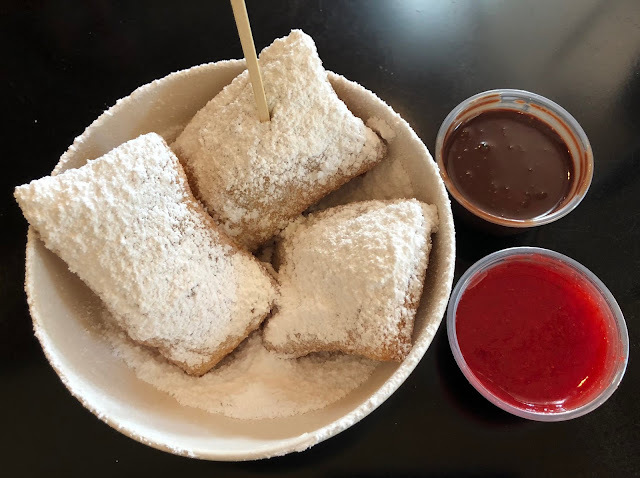 For a while, they were smaller, because the chefs were not pressing the beignet dough out as flat before frying them, so they would have more of a donut-like chew. I liked this version a lot, as long as they were lightly fried, because I don't like my beignets to be too dark. In the last couple of months, Chef Tony and Chef Paul have been adding a little white vinegar to the recipe to make the beignets puff up more. 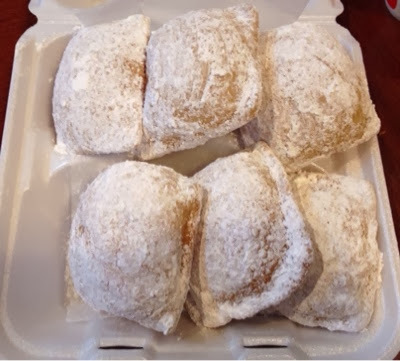 The beignets I ordered earlier this week were some of the best I have ever had at Sassagoula. They were lightly cooked with a lot of powdered sugar, just like I like them. March 10, 2016 Update - Caramel, raspberry, and chicory coffee ganache dipping sauces are now available for the beignets, and they are all gluten free. I had a chance to try all three today, and was really impressed. When dipping my beignets in the raspberry sauce, they tasted like jelly donuts. I did not think I would like the caramel, but it nicely complemented the beignets. If you are a fan of chocolate and coffee, you will love the house made chicory coffee ganache. 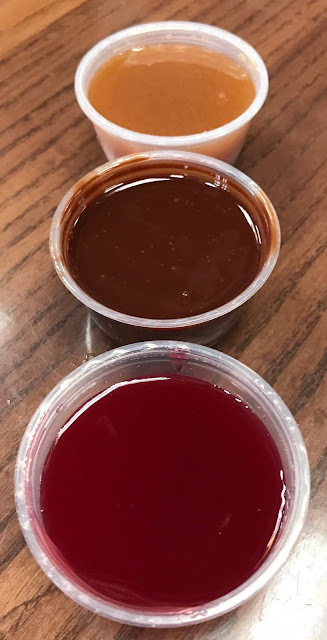 The raspberry dipping sauce, which is gluten free and dairy free, was probably my favorite, but all three were delicious. *Bob’s Red Mill Pizza Dough mix is produced in a facility that handles nuts and soy products, though it is not listed as an ingredient in this mix. In a small bowl, combine the warm water and yeast. Let sit 5 minutes. In a stand mixer or bowl of a food processor, add the water/yeast mix and all other ingredients except half the pizza dough mix (you will add it later). Mix to combine. Add the remaining Pizza mix ¼ cup at a time, mixing after each addition to achieve a dough-like consistency. When that result is reached, turn out the dough to a lightly floured surface (you can use your remaining pizza mix, for this (if any). Roll the dough out to ¼” thickness and cut into 2” x 3” pieces. You can wrap these tightly with parchment paper to separate them and they will keep for up to six weeks in the freezer. 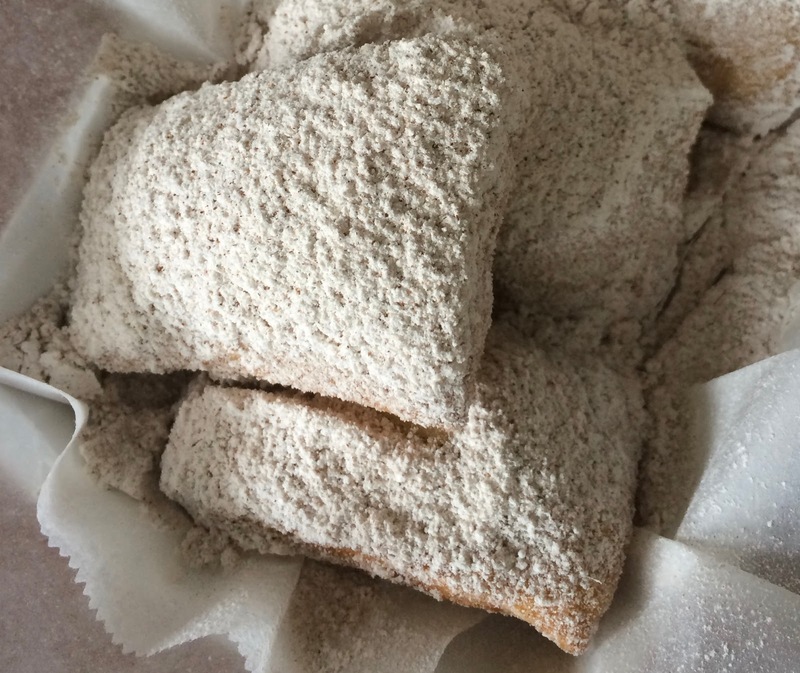 If possible, leave the beignets out at room temperature for 20 minutes before frying. Lightly press the beignets to increase their width slightly. Fry until golden brown, turning once to allow for even cooking. Remove from the hot oil with a slotted spoon and allow to drain on a paper towel briefly. Dust with a generous amount of powdered sugar prior to serving. A huge thank you to Chef Raphael for creating this wonderful recipe, and to Chef Tony for continually working to improve it. You can view a scaled down version of this recipe here. In the fall, add some pumpkin pie spice to the powdered sugar for a great fall treat. It is also fun to make beignet sticks by cutting each beignet into three pieces. After lunch today, I stopped at Sassagoula Floatworks & Food Factory to try their beignet sundae bowl, which was introduced earlier this week. My sundae bowl was served with gluten free beignets, vanilla ice cream, whipped cream, raspberry sauce, and chicory coffee ganache. My friend Ron had a gluten and dairy free version with dairy free vanilla ice cream and raspberry sauce. The beignets are pressed flat before cooking, and fried pressed together so that they form a bowl. My hands got messy tearing the beignet bowl apart, but it was definitely worth it, because my sundae was so delicious. The beignet sundae bowls are still available gluten free, but the beignets are no longer being pressed together. Sassagoula recently switched to gelato instead of ice cream, which has a cross contamination warning for gluten, so I did not get a beignet sundae bowl last week. I could have had a beignet sundae bowl with one of the dairy free ice creams they carry, but I am a big ice cream snob, so I decided to pass. Chef Tony mentioned that they have Tofutti, Rice Dream, and So Delicious. On our recent trip, we had beignets at Sassagoula three times. I love that the restaurant is now using bamboo bowls instead of paper plates. We always order the dipping sauces when we get beignets. 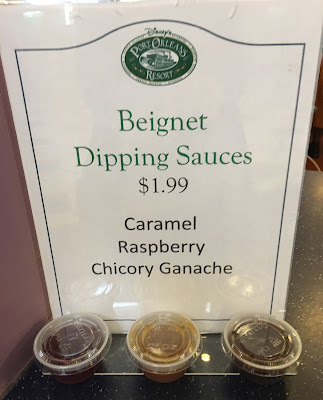 I typically alternate between the raspberry sauce and the chicory coffee ganache, my two favorites. My daughters loved dipping each bite into all three sauces. Sassagoula now serves strawberry sauce instead of raspberry sauce. We loved the raspberry sauce, but the strawberry sauce is even better. Chef Tony is no longer the head chef at Port Orleans, but you can find him over at the Norway Pavilion in Epcot, where is he is working to make the menus even more gluten-free friendly. 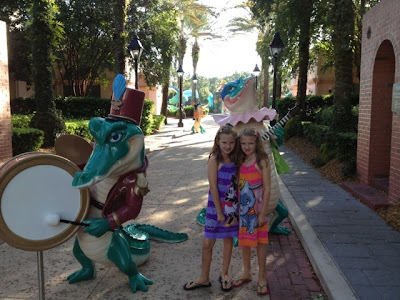 Sassagoula Floatworks & Food Factory is always a fun place to dine because of their Mardi Gras theming. While you are there, be sure to explore the resort, because they have some great photo spots. Because Sassagoula is a quick service restaurant, you never need to make a reservation. Just ask to speak to a chef at any of their food stations to order the gluten free beignets or any other gluten free dishes. 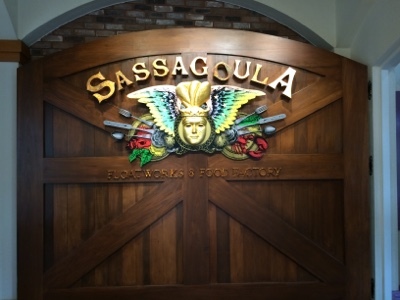 You can read more about Sassagoula Floatworks & Food Factory, and view their menus and hours on Disney's website here. What are your favorite gluten free dishes at Sassagoula Floatworks & Food Factory? Just found this review. OH MY!! How yummy!! You're welcome! We love eating at Disney! Seriously considering staying here just for the beignets! Thank you! We had the beignets the last time we were there. Now it is time to try the Sundae. Counting down to our trip in November. Going in July.. if I want to order a gluten free beignet sundae at night, do I need to call ahead? Or will they have them ready? Jenna - Beignets and beignet sundae bowls do not need to be ordered in advance. Just ask to speak to a chef. Is the price for the dipping sauces per each or for all 3? They are all priced separately. My goal is to provide you with accurate information, but please be aware that product ingredients, restaurant menus, and website links may change without notice. Always be sure to carefully read the ingredients label of any product you buy before consuming it, and talk to your restaurant server/manager/chef before ordering. Unauthorized use and/or duplication of this material without express and written permission from this blog's author is strictly prohibited. Excerpts and links may be used, provided that clear credit is given to Alexis Salerno and Alexis's Gluten Free Adventures with appropriate and specific direction to the original content.